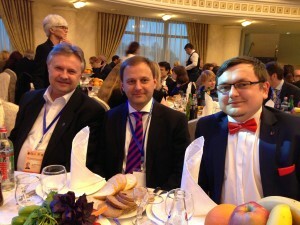 The IX conference of ministers of the European Higher Education Area (EHEA) and the IV Forum on Bologna policies was celebrated in Yerevan, the capital of Armenia, on Tuesday and Wednesday, 14-15 of May 2015. The two-day forum discussed and set new standards for European education, and made important decisions for millions of students and thousands of higher education institutions. The event was attended by more than 100 delegations from 48 “Bologna process” member states, as well as by about 20 ministers of education. 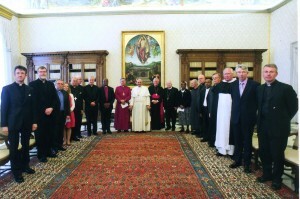 Among those, there was also the Delegation of the Holy See, chaired by Fr. 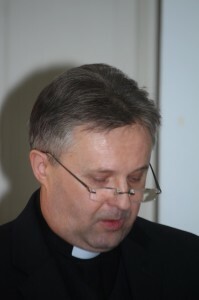 Friedrich Bechina, O.F.S., undersecretary of the Congregation for Catholic Education. 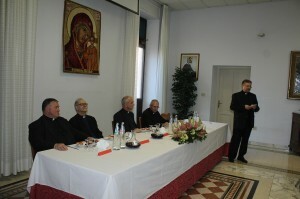 The Rectors of the pontifical institutions of higher education were represented by the secretary of the Conference of the Rectors of the Pontifical Universities of Rome (CRUPR), Prof. Andrzej S. Wodka, C.Ss.R., President of the Alphonsian Academy, incorporated to the Pontifical Lateran University. Finally, the Holy See delegation had also a representative of the Students: Mr. Antonio Arcadi, President of the Association of the Students of the Pontifical Universities of Rome (SUPR). 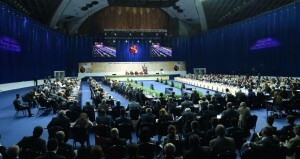 Conferences of the ministers of EHEA countries are held every three years, and the communiqués define priorities for further Bologna process actions in member states. 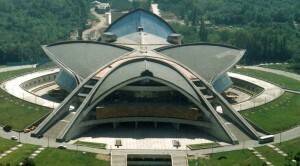 The Yerevan conference reported first on main results in quality assurance, ECTS loans, qualification systems and recognition of the former education described in “Bologna Process Follow-Up Group (BFUG) action plan for 2012-2015. 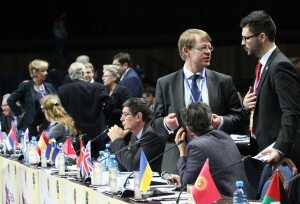 During the Fourth Bologna forum, education ministers of the EHEA member states have met and talked with their colleagues from neighboring countries for the EHEA, including the Mediterranean. The possibility of bilateral meetings between the ministers were seriously considered. The conference has also determined the future of the Bologna process and has defined priorities for the period after 2020. The Ministers underscored in particular a series of more recent phenomena, which influence the higher education in Europe: “Political instability in many of the countries, a high level of unemployment and migration arising from economic and social crisis and lack of access to higher education are among the challenges that we are facing. At the same time, national awakening in the countries is arising hopes of the people for more democratic and tolerant societies, providing opportunities for personal development, as well as development of quality higher education. Reforms of higher education should further the development of democratic culture and equip our societies with the knowledge, understanding and skills to help address the challenges we face. Protect staff and students in answering the academic freedom, integrity and autonomy of higher education institutions is a key to achieving this”. The participants stressed also: “Mobility of students and staff facilitates exchange and creation of new knowledge and helps to build mutual trust and understanding. The rapid technological developments will impact on higher education and the way in which it will be reformed”. As the Forum drew together more than 500 participants from Armenia and other countries, including 350 members of foreign delegations and 20 representatives on the level of ministers, it was a particularly rich experience for the Holy See Delegation. Fr. F. Bechina had a privilege to moderate a Plenary Interactive Panel on the Bologna Process Implementation: Main Conclusions and Recommendations. The panelists represented European Commission (EC), Council of Europe (CoE), European University Association (EUA), European Association of Institutions in Higher Education (EURASHE), European Student’s Union (ESU), European Association for Quality Assurance in Higher Education (ENQA), European Quality Assurance Register for Higher Education (EQAR), Education International (EI) and BusinessEurope. Discussions kept us more involved more in the sessions dedicated to: Bologna with Student Eyes 2015 – a Reality Check: Time to Meet the Expectations from 1999 (A. Arcadi), Prospects for e-Learning in European Higher Education (A. Wodka). Finally we assisted to the sessions on Regional Initiatives of Cooperation Similar to the Bologna Model: Cooperation in Latin America, in Middle East and North Africa (MENA), Association of Arab Universities (AAU), Association of Southeast Asian Nations (ASEAN) and The World Bank. 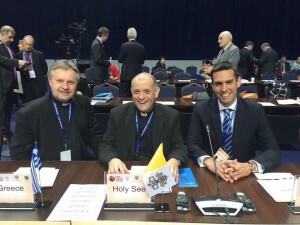 The Holy See is a respected member of the EHEA, as well as in other parts of the World. The Congregation for the Catholic Education is the reference point to around 1500 “Catholic” Universities (majority in Asia and America) and to around 670 “Ecclesiastical” HE Institutions worldwide in 75 countries, embracing several thousands of university students in in all continents. What the Holy See searches always to promote is the integral formation of the human person, aiming at the professional preparation but also at the sapiential development of the spiritual qualities of the human beings in their social relations. 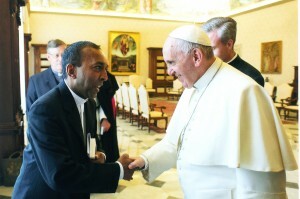 In this, the Holy See has unprecedented experience and richness of approaches, in dialogue with human sciences of all kinds. This is why a reference to the religion as essential formation dimension has been preserved in the final statements adopted at the end of the summit (Declaration of the Bologna Policy Forum and a Yerevan Communique of the Conference of the EHEA Ministerial Confernce). The next Bologna Policy Forum will be organized in conjunction with the Ministerial conference in 2018, in France. Rev. P. Réal Tremblay, C.Ss.R. ogni anno l’Accademia Alfonsiana fissa un giorno di festa per celebrare il suo cleleste Patrono, Sant’Alfonso M. dei Liguori, Dottore della Chiesa e Patrono dei moralisti. Essendo il 1° agosto una data impraticabile, siamo soliti radunarci dopo Pasqua per un pasto cordiale, quasi un prolungamento delle cristofanie di Genesareth, invitando – insieme a coloro che ogni giorno si dedicano al funzionamento dell’Istituto – alcune Autorità universitarie e i reverendissimi Rettori dei Collegi romani che affidano alla nostra cura accademica i loro studenti. E’ così il nostro onore ospitare oggi il Prorettore della PUL di cui siamo parte incorporata, il Mons. Renzo Gerardi, il quale rappresenta il Rettore, S.E. Mons. 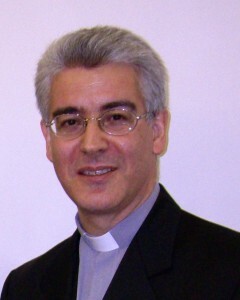 Enrico dal Covolo, S.D.B., impegnato in un convegno celebrativo del 50° della Gaudium et spes. Sono qui con noi altri Rettori delle Pontificie Università e Atenei Romani, a partire dalla Presidenza della CRUPR, il Mons. Luis Romera, Rettore della P.U. Santa Croce e il P. Juan Javier Flores Arcas, OSB, Rettore dell’Anselmianum. 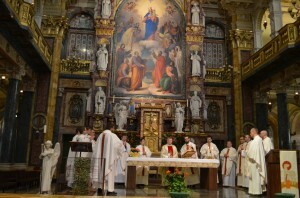 Con gioia accogliamo fra noi i Rettori magnifici della PUST Angelicum (P. Miroslav K. Adam, OP) e dell’Ateneo Pontificio Regina Apostolorum (P. Jesus Villagrasa, LC). Un “grazie” festoso per la presenza ai Vicerettori della P.U. Antonianum, P. Augustín Hernández, OFM, e della P.U. Urbaniana, la prof.ssa Lorella Congiunti. Dei Presidi è nostro privilegio avere tra noi il P. Santiago Gonzáles Silva, CMF, Preside dell’Istituto gemello Claretianum e sempre atteso ex-Alunno. 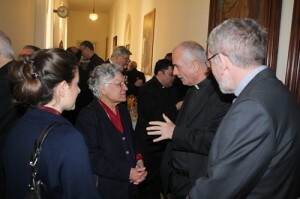 Ringrazio vivamente il Moderatore Generale dell’Accademia, il Rev.mo P. Michael Brehl, CSsR, per la benedizione della nostra mensa e per sue cordiali parole di benvenuto. In lui si riassume tutta la Congregazione redentorista, insieme con il Governo Generale qui presente, insieme con la Comunità Sant’Alfonso che nella persona dell’Economo, P. Helcio Testa, ha organizzato per noi la festa, insieme ai Confratelli redentoristi che si uniscono oggi ai docenti, ufficiali e il personale non docente, in questo momento di festa. 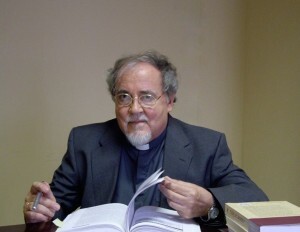 Mentre una bella rappresentanza degli studenti dell’AA, con il Vicepreside, il prof. A. Amarante, CSsR, è andata a Pagani, per pregare sulla tomba del Santo Patrono, noi spezziamo qui il pane della fratellanza con Voi, cari Amici dell’Istituto. Come istituto di teologia morale, cerchiamo di offrire il meglio della nostra competenza per prepararli, affinché – come Sant’Alfonso -, abbiano una “visione realisticamente ottimista” delle risorse di bene che il Signore dona ad ogni uomo, e – come Alfonso – sappiano dare importanza anche agli affetti e ai sentimenti del cuore, oltre che alla mente, per poter amare Dio e il prossimo (parole di Benedetto XVI) in un mondo che cambia come un caleidoscopio. Secondo le parole di Papa Francesco, pronunciate proprio ieri (19 aprile 2015), auguro a tutti noi, formatori delle coscienze, di essere innanzitutto testimoni che sappiano “vedere, ricordare e raccontare”, secondo i tre verbi che descrivono l’identità e la missione di un testimone. Incontrando qui dei testimoni di Gesù che cammina con noi, gli Alunni impareranno non soltanto le teorie atte ad illuminare i problemi, ma troveranno le risposte al grido di redenzione che continuamente sale verso il cielo, anche nei drammi come quello di 700 persone recentemente naufragate nel Mar Mediterraneo nella ricerca della felicità. E’ giusto fare anche questo ricordo, mentre ci diciamo “buona festa”, sapendo che per molti oggi sono state riservate lacrime amare. Ringraziando tutti che hanno preparato la festa e ora la servono a noi, finisco con un “buon appetito”. 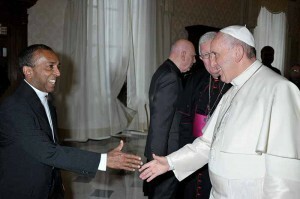 Sant’Alfonso si rallegri nel vederci e mandi dal cielo le grazie di cui abbiamo bisogno, specialmente quella di una compassione grande come il mondo. Buona festa! Era veramente bello, tutto è andato bene e gli studenti sono stati contenti con il programma della Gita. Alle 7.00 siamo partiti da Roma e alle 10.00 siamo arrivati a Pagani dove ci aspettava prof. Amarante. Alle 11.00 abbiamo celebrato la Messa pregando anche per Lei. Il prof. Amarante ci ha mostrato il museo e dopo il pranzo, siamo partiti per Pompei. Per molti di noi era la prima volta a Pompei e dopo la visita guidata di tre ore, abbiamo visitato il Santuario della Beata Vergine del Rosario di Pompei. Dopo una breve preghiera personale, siamo partiti per Roma. Grazie Dio per questa bella esperienza e l’occasione per conoscerci meglio. Con noi c’erano i professori Faggioni e Fidalgo e 7-8 studenti dalle altre Università Pontificie. 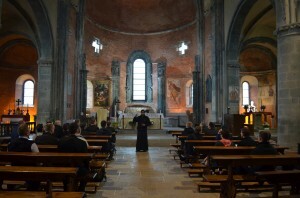 Il giorno 30 aprile 2015 il Santo Padre Francesco ha ricevuto in Udienza i Membri della Commissione internazionale anglicana-cattolica. Ha partecipato in qualità di questa Commissione il Rev. P. Vimal Tirimanna, C.Ss.R., professore dell’Accademia Alfonsiana. 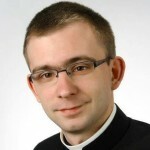 il Rev. P. Jules Mimeault, C.Ss.R. IIl progetto “SINDONE: VERITÀ ED ENIGMI”, intende essere un percorso di studio e di approfondimento delle principali tematiche scientifiche, storiche, iconografiche, mediche, teologiche legate al “misterioso” telo di Torino. 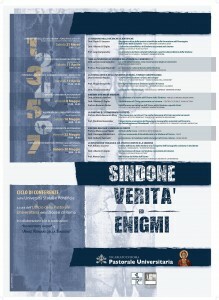 L’Ufficio della Pastorale Universitaria della Diocesi di Roma, in collaborazione con le associazioni “Amici romani della Sindone” e “In novitate radix”, ha organizzato questo ciclo di incontri, intendendo offrire una panoramica divulgativa, seria e sufficientemente ampia dell’argomento anche in vista della prossima ostensione primaverile. 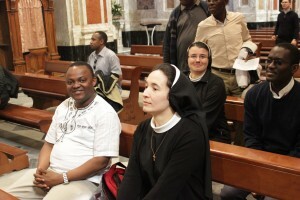 Il progetto prevede infatti sette incontri che si svolgeranno in varie università statali e pontificie al termine del quale i giovani universitari della Diocesi di Roma avranno la possibilità di recarsi in pellegrinaggio a Torino per venerare e ammirare il Telo con la misteriosa Immagine dell’eloquente Uomo della Sindone, il quale, attraverso le impronte di sangue, richiama alla memoria un altro Uomo, il Gesù dei vangeli, che i cristiani professano, testimoniano e credono risorto e Vivente. La Sindone di Torino infatti, al di là di tutto, è un segno da decifrare, un messaggio che ci permette di confrontarci intorno alla figura del Cristo, e all’esperienza drammatica della sua passione, della sua morte e della sua risurrezione dai morti. Un grazie sincero va alle istituzioni accademiche che hanno aderito all’iniziativa, a quelle che la ospiteranno, e ai cappellani universitari per aver accolto con disponibilità il progetto. Nei primi giorni di maggio mi sentivo come uno dei discepoli che correvano insieme verso il sepolcro. Come quello che è arrivato primo. “Chinatosi, vide le bende che giacevano distese; tuttavia non entrò. Arrivò poi anche Simon Pietro che lo seguiva ed entrò nel sepolcro; vide le bende che giacevano distese e il sudario che era sopra il capo; esso non stava assieme alle bende, ma a parte, ripiegato in un angolo. Allora entrò anche l’altro discepolo ch’era arrivato per primo al sepolcro, e vide e credette.” (Gv 20,5-8). Lui ha visto il sepolcro vuoto, ed anche le bende, il sudario – i testimoni silenziosi della Risurrezione. Così come loro, anche noi, Istituto Polacco a Roma, siamo stati in pellegrinaggio a Torino. Per sperimentare questo incontro come uno dei Testimoni della morte i risurrezione di Cristo, per visitare la Sacra Sindone. Non voglio scrivere qui sulla sua storia, o discutere sulla sua autenticità. Senza questa sicurezza della fede, il pellegrinaggio non avrebbe senso. Vorrei scrivere solo il pensiero dell’uomo che ha sperimentato la grazia e ha visto una moltitudine di quelli che sono arrivati alla Basilica di Torino , per aumentare la propria fede. 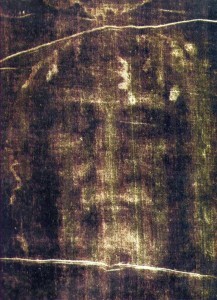 Ho visto la gente, che davanti a questo riflesso del volto di Gesù, rimaneva senza le parole e nel silenzio contemplava il grande mistero della sua misericordia. Con loro anch’io, in questo silenzio, potevo affidare a Lui tutto: la mia fede e i miei dubbi, tutto il bene e tutta la debolezza, ogni preoccupazione, ogni gioia e ogni speranza. Con tutto questo ho potuto presentare a Cristo anche tutta la nostra Accademia, tutti noi che come comunità impariamo come camminare nel suo amore. Vedendo questa gente a Torino, pensavo anche a tutti quelli che sono come l’altro discepolo, san Tommaso. Chi sa, forse qualche volta siamo anche noi come loro? E non siamo abbandonati da Dio. Nel suo amore Dio ci lascia toccare se stesso. La Sacra Sindone ci ripete le parole di Gesù, “metti il tuo dito qui e guarda le mie mani, porgi la tua mano e mettila nel mio fianco, e non essere più incredulo, ma credente” (Gv 20,27). 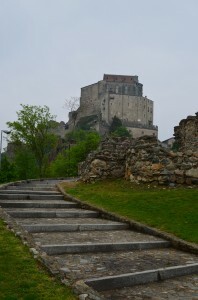 Che grande misericordia! Lui sostiene la nostra debolezza e risponde con l’amore quando manca la fede! Vi invito a fare questo pellegrinaggio. Approfittate di questo tempo di grazia! Anche se la vostra fede è forte e non la manca nulla, sempre potete ripetere con i discepoli: Signore aumenta la nostra fede! (Lc 17,6). E Lui risponde, perché ci ama e sempre vuole dare in più.